Short layover and transfer times at airports require reliable and fast baggage handling especially at peak times. BEUMER Group provides the perfect solution with its BEUMER autover high-speed baggage conveying system. The system supplier developed the intelligent autoca vehicles for quick and careful transport of standard suitcases, bags and oversize baggage to their intended destination. They convey baggage items of different shapes and sizes on the same rails and at the same speed. This visionary solution is chosen by international airports such as Moscow-Sheremetyevo putting them in a great position for future growth. The BEUMER autover system is comprised of a passive rail system and individual vehicles, the BEUMER autoca. Each of those vehicles receives orders from a central unit that is equipped with the BEUMER logistic software BeSS (BEUMER Sortation System). After check-in, they are driven to their destination autonomously, quietly and independently from each other with a speed of up to ten kilometres per hour and a maximum item load of 50 kilogram. Their on-board controller computes the ideal route. Furthermore, the vehicles can deposit bags in, and withdraw bags from, early bag storage. If one of the x-ray devices fails, the BEUMER autoca with the baggage that needs to be scanned is directly diverted to a device that is ready for use. This ensures a high degree of operational reliability. 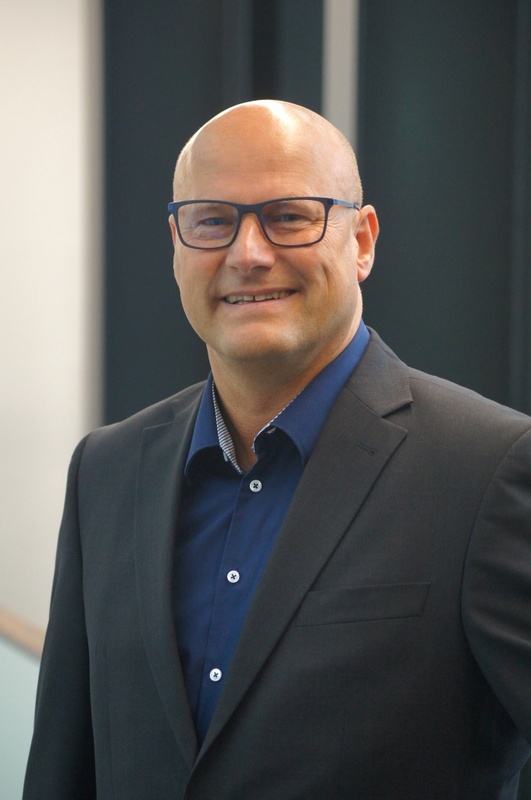 “New segments can be easily added, in case the rail system at the airport needs to be extended,” explains Thomas Frank, Senior Systems Manager Airport at BEUMER Group. The baggage conveying system requires little space, because narrow curves and switch points are used with small radii of 1.25 metres. The vehicles also navigate long distances and challenging layouts that include climbs and drops. “We continued to develop the BEUMER autoca vehicles further, in order to make our high-speed baggage conveying system even more flexible and adaptable to very different baggage items,” reports Frank. The goal was to transport standard suitcases and baggage items with lengths of up to 2.5 metres with different carriers in the same rail system and at the same speed, getting them to their destination quickly and gently. Depending on the transported items, the BEUMER autoca vehicles are used with belts or containers mounted on the BEUMER autoca. 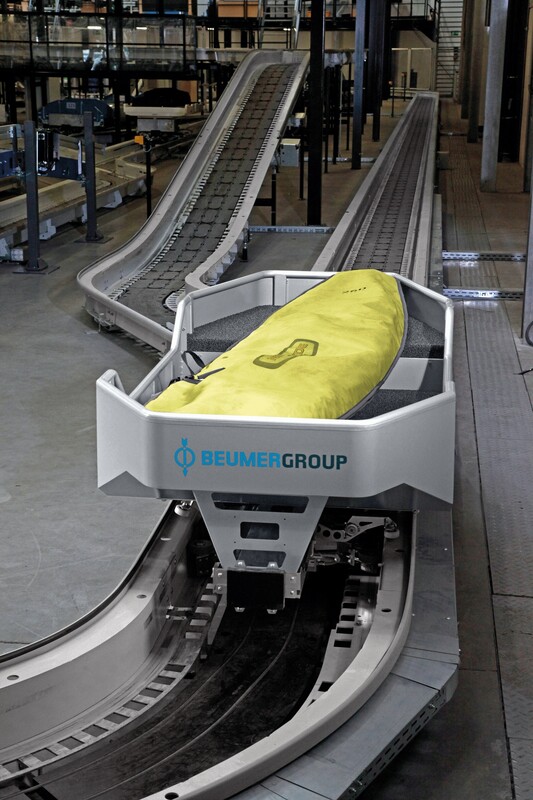 “This means that we can now use the BEUMER autover to also safely transport oversize baggage like surboards, skis, umbrellas or strollers,” emphasises Frank. During operation, the number of active vehicles can be automatically adjusted to the number of items to be transported in order to minimise energy and maintenance costs. The BEUMER autover then transfers the the baggage seamlessly to other systems, such as the tote-based baggage transport and sortation system CrisBag from the BEUMER Group product range. The new BEUMER autoca, with the designation NG III, now has a concave shaped belt with a grid pattern. This prevents even suitcases with wheels from slipping. “The previous model used a smooth and even belt,” reports Frank. “In order to secure the load, both sides were equipped with flaps that could open and close automatically during loading and unloading.” These are now no longer necessary. BEUMER engineers have instead made the side walls higher and equipped them with a robust sheet metal structure. Six photocells in each vehicle permanently monitor the position of the baggage item, so it can be centered during the transfer. In order to make maintenance easier, this new version has the entire drive technology located on one side of the vehicle. The wiring was moved to the back side. For better positioning, the conveyor drive was equipped with a new pulse generator. The BEUMER engineers also installed a central processing unit that is four times faster. This considerably improves its utilisation and the response time of the system compared to the previous version. In order to guarantee a smooth operation, the self-diagnostic functions of the BEUMER autoca vehicles check in autonomously for maintenance at customisable intervals, if necessary. Just one mouse click and the corresponding vehicle drives towards the central maintenance area. This does not influence the remaining baggage transport. If required, operators can receive a text message notifying them of vehicles due for service. “But thanks to contactless energy and data transmission, the operational and maintenance costs are very low for our BEUMER autover,” explains Frank. The lack of wear parts, and a rail system that is essentially maintenance-free, reduces total operating costs. “If baggage volume is low, the BEUMER autoca vehicles simply drive into their preset parking zone and wait for their turn. This saves additional energy,” says Frank. The system also provides complete compliance with fire protection regulations: If the baggage conveying system runs through fire protection zones, the rails are automatically raised in case of fire allowing fire protection doors to close. The BEUMER autover allows only one baggage item per load carrier or container. This improves traceability and safety. During each processing phase, the transported item can be located with absolute accuracy. This becomes increasingly important since in recent years, airports and airlines have wanted to provide this as a service to passengers. Meeting the requirements of IATA Resolution 753, which will come into effect in June 2018, is another factor of having this ability. It basically states that members of the International Air Transport Association will have to be able to more precisely track the baggage of their passengers. BEUMER Group’s BEUMER autover uses the Independent Carrier System (ICS) that meets the high demands coming from passengers and authorities. “Our system guarantees absolute traceability during each transport phase, because each item remains in the same container or on the same belt, from check-in and early baggage storage to screening and discharge,” says Frank. “At Montreal airport for example, we tied in the BEUMER autover directly with various phases of security checks.” At any point in time, each baggage item can be clearly assigned to a BEUMER autoca vehicle and to the passenger: Any bag, which is deposited in the early baggage storage system by the BEUMER autoca, is not released and transported to its final destination until a passenger and that passenger’s corresponding baggage have been identified as “secure”. Besides Montreal, the BEUMER autover is already used at other international airports such as Dubai, UAE, and Nice, France, and will soon be in operation in Stansted, UK, and Russia’s largest airport Moscow-Sheremetyevo. The current volume of passenger traffic is 31 million per year. The operator’s strategy is to handle an increased volume of 40 million passengers by 2030. In order to achieve this, they are expanding their northern terminal complex. Almost two kilometres separate it from the southern part of the airport. They are connected via a tunnel. It is planned to equip the tunnel with the BEUMER autover, so that the connecting times for passengers can be shortened. BEUMER Group’s scope of supply includes the design, manufacture, supply, installation, commissioning and the implementation of the baggage conveying system. Installation work began in February 2017. The overall rail length will be almost five kilometres. 187 BEUMER autoca will be in operation. The goal is to move 900 baggage items per hour, in each direction. “The rails operate without any moving parts, which means that only minimal maintenance work will be necessary in the tunnel,” says Vladislav Dementiev, General Director BEUMER Russia. 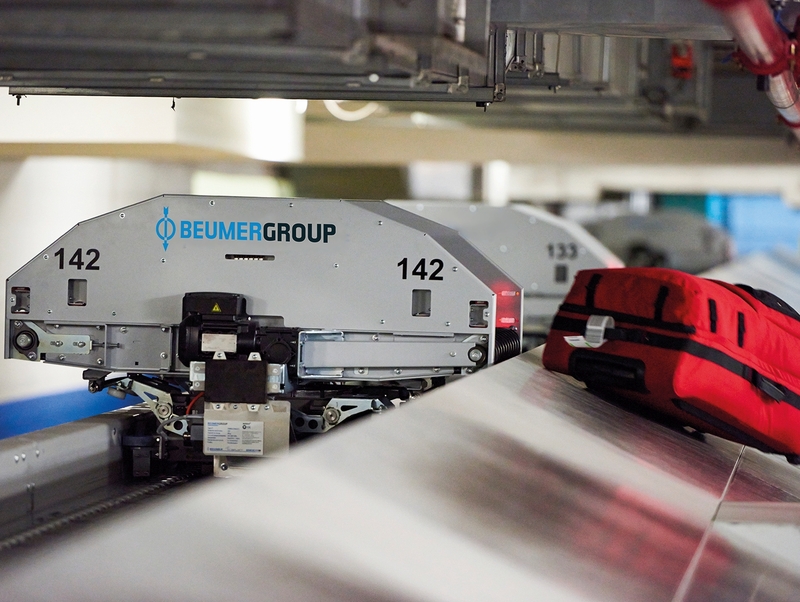 By opting for the BEUMER autover system, Moscow-Sheremetyevo will be able to minimise the baggage connecting times between the terminals. Each baggage item will be properly handled and transported to the correct destination. The airport will become the most important aviation hub in Russia. BEUMER Group equipped its BEUMER autover high-speed baggage conveying system with the enhanced BEUMER autoca. The intelligent BEUMER autoca vehicles are now capable of transporting standard baggage such as suitcases and bags and oversize baggage on the same rail system and at the same speed.